Kidney stones are considered as hard collections of minerals and salt that are made up of uric acid and calcium. They are developed inside kidney and are also able to travel up to the other parts of the urinary tract. These stones use to vary in size; they can be as small as of one-inch dimension whereas others can grow up to a few inches. The sad truth is that some of these can grow as high as to cover the entire kidney. Experts reveal that kidney stones are developed when few body minerals get accumulated in urine. It happens when your body gets too dehydrated, and concentration of minerals reaches a higher level in urine. More minerals have the ability to form a stone in the kidney. 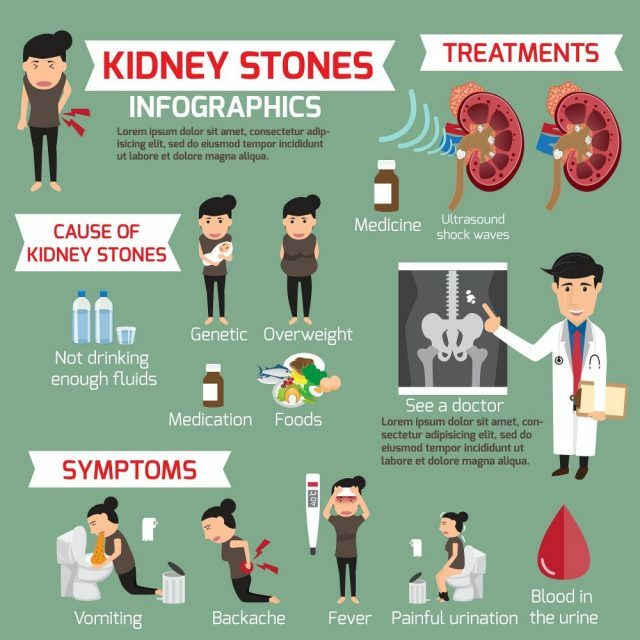 As per some recent stats, at least one out of 11 people is suffering from kidney stones in the United States and this disease is common in men, especially those who are suffering from diabetes or are obese. 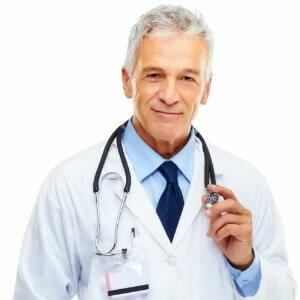 Medical health experts reveal that presence of smaller kidney stones in kidney does not cause any major symptom. A person starts noticing some trouble only when the stones move to the ureter, a tube that helps urine to travel from kidney to bladder in your body. Kidney stones are very painful; generally, most of these stones come out of the body without any special treatment, but the larger ones are required to be broken up and removed with medicinal procedures. Kidney helps to regulate different fluids, salts, minerals and many other substances in different parts of the body. When these compounds suffer imbalance, they form kidney stones. Studies reveal that men can suffer from four different types of kidney stones and each one of them is made up of a different substance. Cystine and urine acid and the two common compounds that are responsible for the formation of kidney stones. 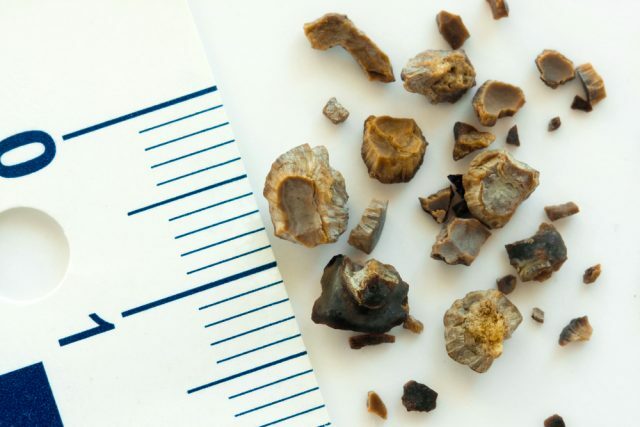 Few major factors leading to the development of kidney stones include family history, dehydration, genetics and impact of the certain medical condition. 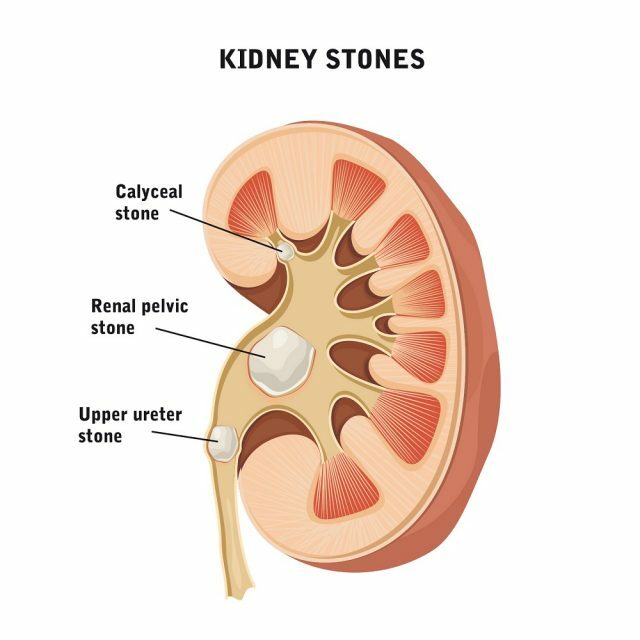 If anyone in your family has already suffered because of kidney stones, the risk of disease increases on other members as well. Patients report too much discomfort due to a kidney stone. The pain caused by this medical health condition is named as renal colic, and it is listed as one of the most unbearable pains for humans. You can compare this pain almost equal to the pain that a mother faces at the time of childbirth or when a person is stabbed with a knife. Around 1 million patients are moved to an emergency ward in the hospital every year due to this intense pain. This pain usually starts when stone starts moving into narrow ureter; it leads to some blockage and generates unwanted pressure in the kidney area. This pressure activates various nerve fibers that are responsible for transmitting pain signals to the brain. Kidney stone pain can rise at any time, and it keeps on shifting its location as well as intensity as per movement of stone inside the body. Some patients also report a wavy pattern of this pain as sometimes it lasts for few minutes, disappears and then returns. This pain can be felt at the back, side, and right below the rib area. When the stones start moving in the urinary tract, the pain may also radiate in the groin and belly area. The severity of this pain depends upon the size of the stone, and the treatment must be applied accordingly. When the stone reaches bladder and ureter junction, the pain becomes more noticeable during urination. 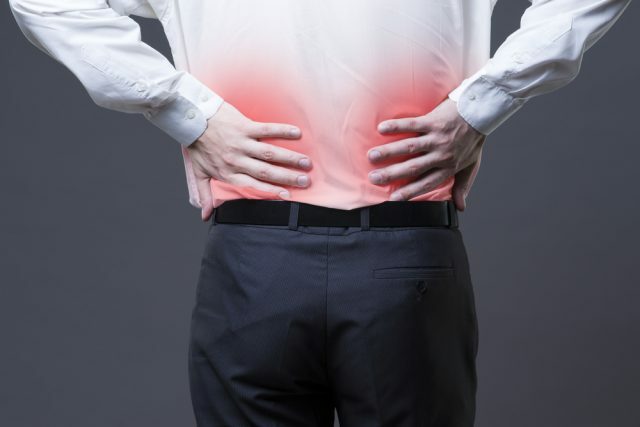 This condition is named as dysuria, and it often leads to sharp burning sensation and pain. Some people also misinterpret this condition with urinary tract infection; however, there are chances to have an infection along with stones as well. Few symptoms of kidney stones are also mimicked as sexually transmitted infections as they cause pain in genital area with burning sensation at the time of urination. When you experience any of such symptoms, it is important to look for some immediate diagnosis to deal with the issue as soon as possible. A person suffering from a kidney stone is more likely to feel the urge to go to the bathroom, even when you have not consumed much fluid. If this happens to you, the chances are that stones have traveled to the lower portion of the urinary tract. In this condition, the patient keeps on running to the toilet several times a day and night as well. Sometimes, this urinary urgency is also misidentified as a symptom of urinary tract infection. Here is a common symptom of urinary tract stones and it is also named as hematuria. The blood in urine can be of brown, pink or red color. Although these blood cells are very small to observe, doctors can identify them during the test with the help of a microscope. That is why this disease is also named as microscopic hematuria. When the kidney stone grows and blocks the urethra region, you may notice tinged urine with the presence of blood cells. Note that this blood enters urine in the process when kidney stones enter urethra region, scraping against kidneys or ureter. When you are healthy, your urine does not contain any odor, and it has a strong color. In case if you observe foul-smelling or cloudy urine, it can be considered as a common sign of kidney infection or at any other part of the urinary tract. Studies reveal that almost 8% of people that are suffering from acute kidney stones also develop symptoms of urinary tract infection. Cloudiness is considered as a common sign of pyuria and urine. This smell generally come with bacteria that are responsible for urinary tract infections. This medical health condition causes lots of discomfort and the intense pain caused by larger stones need immediate assistance from professionals. Large kidney stones can often get stuck inside ureter. This unwanted blockage further leads to slowing down the flow of urine. People that are affected by kidney stone often urinate by a small amount and the flow may even stop when some medical emergency arises. The kidney stone can also cause swelling in the lower back area along with painful inflammation, groin and surrounding area of the abdomen. If ignored, these areas will become painful to touch and then the person needs immediate attention from medical health experts. In case if this condition is not treated in time, it can cause septic shock to the body due to the higher range of toxins in the body. Many people also suffer from nausea due to the presence of kidney stone. 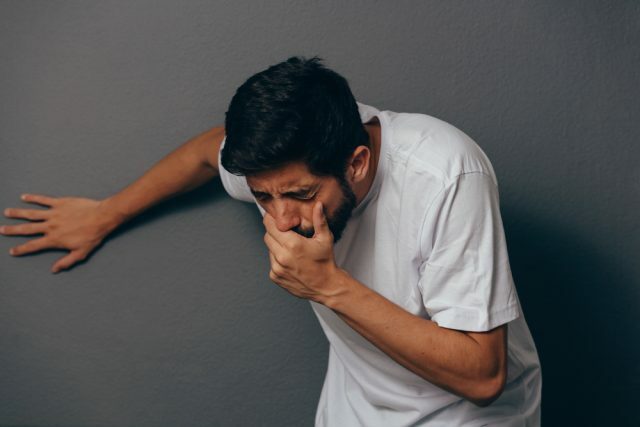 Medical health experts also report that when this nausea becomes severe, it may also cause vomiting and if not treated on time, it may many other complications as well ranging from dehydration to nutritional deficits. One major trouble associated with the intense kidney stone pain is vomiting, and it is noticed when a patient passes a kidney stone. In some cases, this pain becomes so intense that patient throws up. One more reason why vomiting is associated with kidney stones is that kidney plays an essential role in the elimination of toxins and other waste from the body. When a person is suffering from kidney stones, this organ deviates from its normal functioning; it means the toxins and impurities do not come out of the stomach and it gets mixed in the bloodstream. It is important for the human body to get rid of these unwanted materials on time but the failure of kidney functions cause vomiting as it is the other way to expel that waste. As soon as the kidney stone grows up to a larger size in your body, the patients start feeling some discomfort in sitting or laying down for a longer time. It happens just because laying down, or seated postures cause additional pressure on affected area leading the intense pain. This condition also generates excess pressure when kidney stone forms contact with other internal systems. Some studies and evidence reveal that one way to combat this pain is to pace around to standing up. The pain and uncomfortable pressure caused by kidney stone also cause a disturbance in normal sleep. 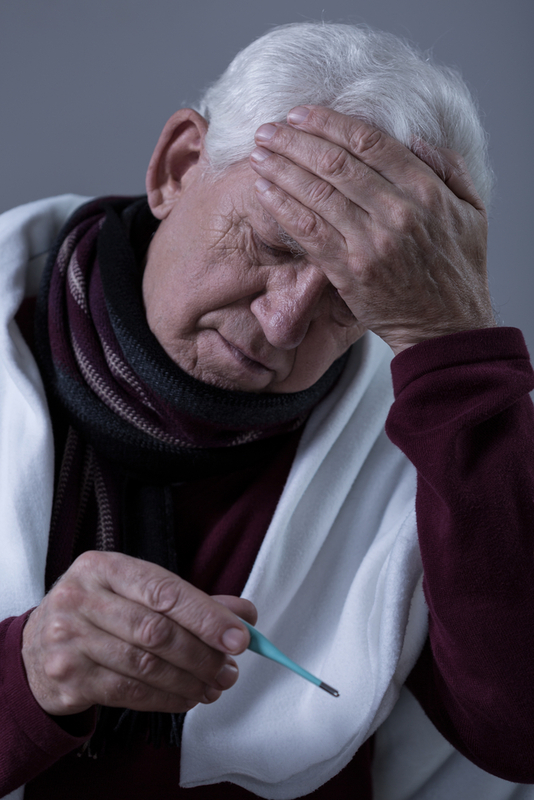 When you suffer sleep loss and unrestful sleep for a longer time, it may also cause decay in cognitive performance and person also loses his ability to concentrate. 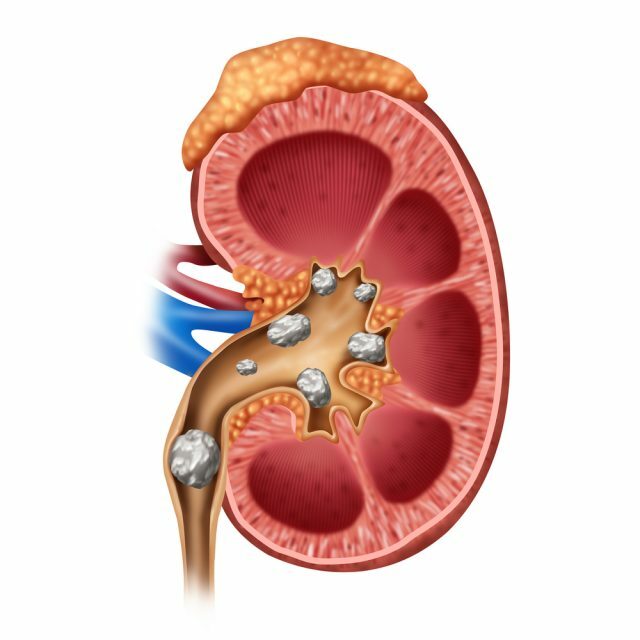 Generally, the smaller size of the stone in kidney does not cause any major discomfort or pain. Some patients report scratching against surfaces, problems in the urinary tract and this condition can also create wounds in an internal area that can become infected with time. The heightened risks of kidney stones include Urinary Tract Infections that further leads to chills and fever. Few more symptoms of UTI caused by kidney stones include abdominal pain, foul smell and abnormalities in urine color along with increases the consistency of urination. The fevers caused by kidney stones can sometimes reach a higher level; in this condition, the patient needs immediate medical treatment.